It was another beautiful summer day at Orphans of the Storm®, and I got to know another great group of pooches that you should be sure to meet! 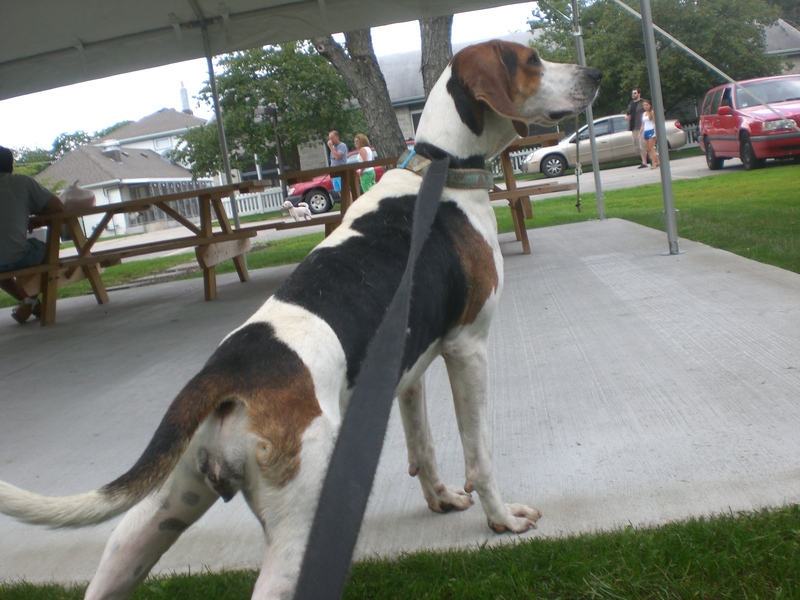 Dolly the two-year-old Treeing Walker Coonhound mix has a very appropriate name, because she’s a real doll of a dog! 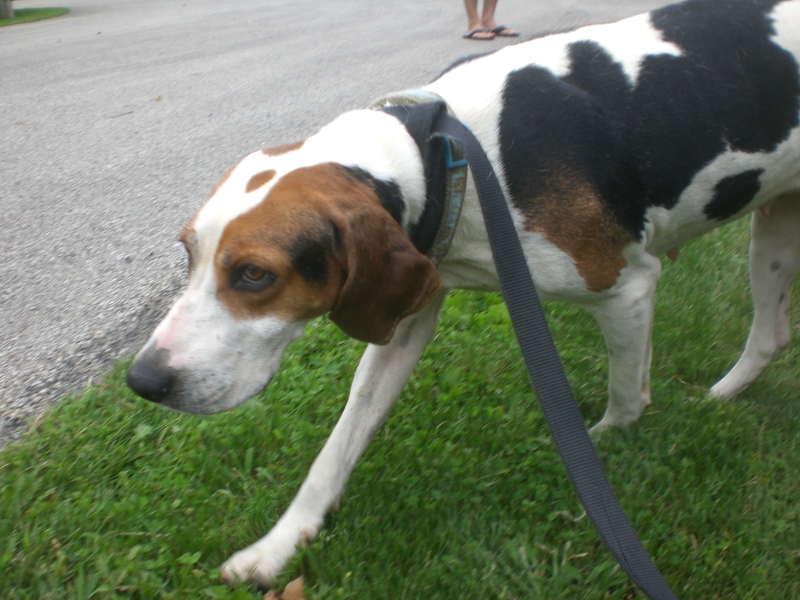 Dolly is also about as perfect a hound dog you’re going to find. She looks like a hound, she acts like a hound, and (although I didn’t actually hear her bark) she probably sounds like a hound! 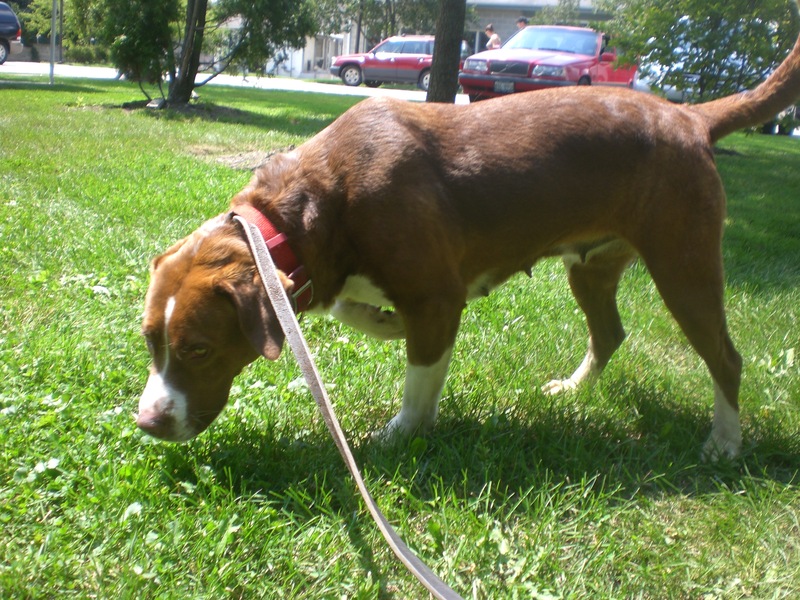 Dolly walked well on the leash, but spent most of her time with her nose following invisible trails in the grass. She was sharing her kennel with a puppy who has since been adopted, so she could go to a home with or without another dog. If she can tolerate a playful puppy, she’ll probably get along with most other dogs! Dolly is a sweet, gentle girl who is ready and waiting for her new family to find her. 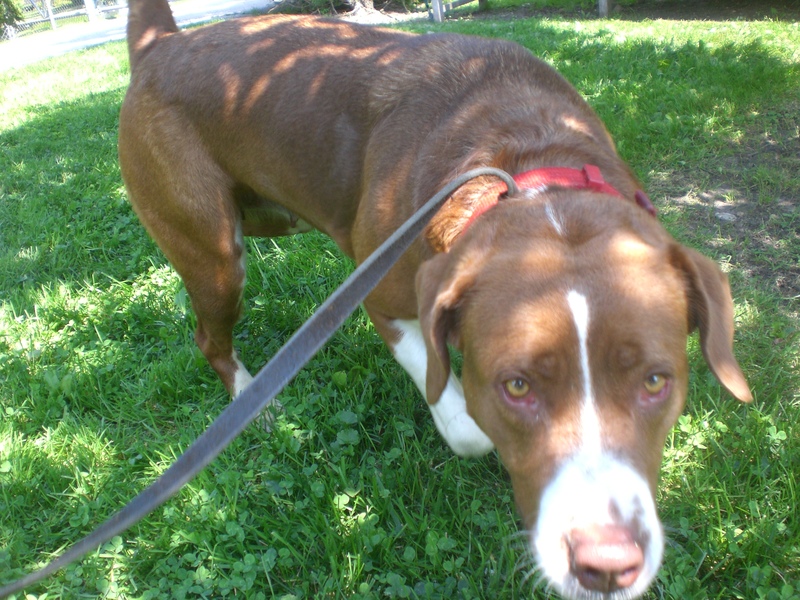 Melvin the four-year-old Plott Hound mix is such a handsome boy. 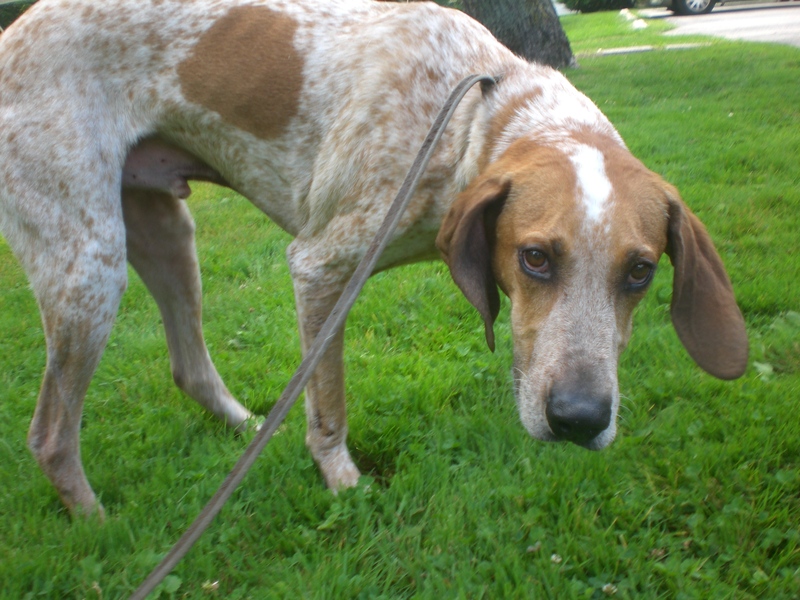 You don’t see too many dogs with his markings and coloring, so he’s sure to catch your eye as you walk through the different wings of kennels at the shelter. Once he’s caught your eye, he’ll catch your heart too! This big boy has an equally big heart that he can’t wait to share. Even though Melvin isn’t a puppy anymore, he still has those sad puppydog eyes that will make you want to give him a giant hug. Melvin was also sharing a kennel when I met him, so he’s another pooch who could go to a multi-dog home. Melvin enjoyed getting pet by all of the different people we met while we were on our walk, and would enjoy a family of his own even more! Come in soon to meet him! Topaz the three-year-old Labrador Retriever mix is one big snuggle-bug. She has a fair amount of energy when she first gets out of her kennel (understandably) but turns into a great walking companion in about 30 seconds. Another reminder to not immediately be concerned by how much a dog is pulling on their leash when you first meet them; most calm down considerably after they get a chance to stretch their legs. Topaz is a very pretty girl with a bright, friendly face that you’re sure to fall in love with. While Topaz and I were sitting in the grass, she first rolled over for a quick belly rub and then sat back up and tried to climb into my lap by putting her front paws on my legs. She then proceeded to give me a few doggy kisses. The same thing happened when I was sitting on a bench a little later: more paws in my lap, and more kisses. Topaz clearly loves people; however, she doesn’t love other dogs so she would need to be the only pooch in her new furever home. 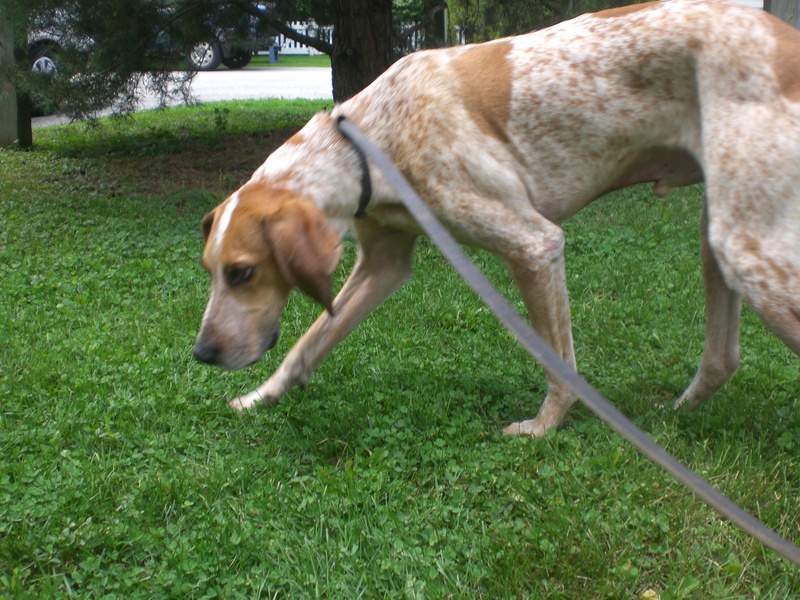 If you’re a one-dog kind of person, Topaz could be that one dog for you! 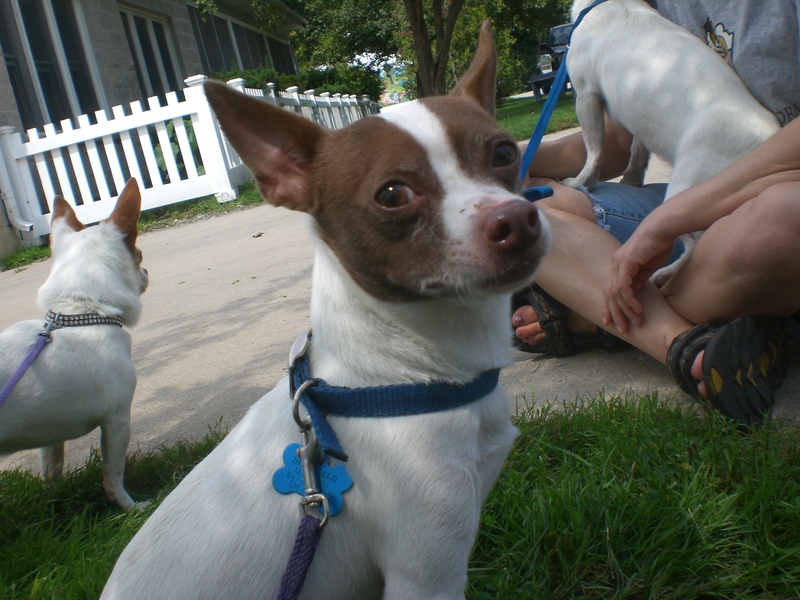 I spent just a few minutes with a group of three Chihuahua mixes who are new to the shelter: Benjamin the seven-year-old, Cisco the three-year-old, and Cypress the one-year-old. Benjamin was by far the most outgoing of the three. He was ready to walk around and explore, and was wagging his little tail most of the time. Cisco was the lapdog of the group. When I met him he was curled up in the lap of another volunteer, and seemed very content to stay there. 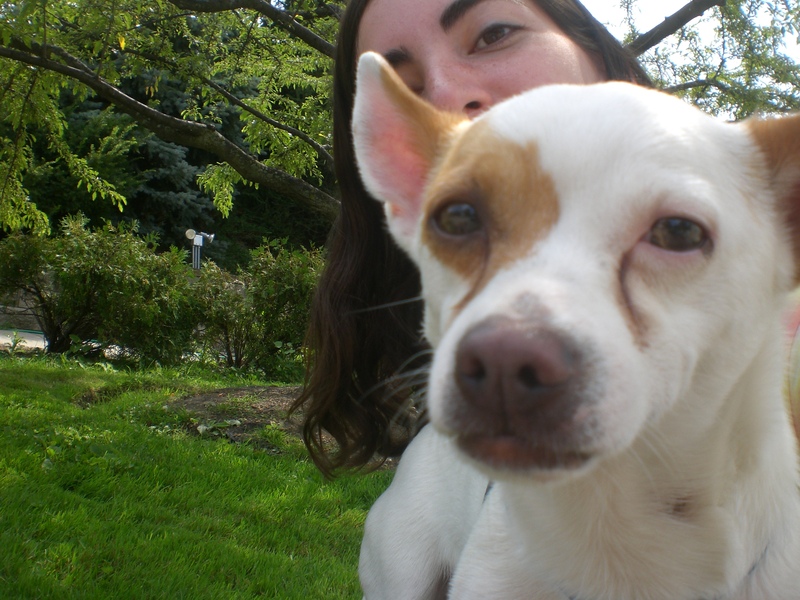 He then took some tentative-but-brave steps across the grass to climb into my lap, where he was the perfect size for cuddling. Cypress was somewhere between Benjamin and Cisco on the bravery scale. He wasn’t trying to cower in anyone’s lap, and seemed to be at least cautiously interested in the idea of exploring, but his poor little tail was tucked between his back legs for the first few minutes. He needs someone to give him some courage! There was construction of a new doghouse going on in the yard where I usually play with Molly and Reebok, so Craig and I took them for a little walk around the shelter property instead. I just don’t know what they’re still doing at the shelter! I was also able to walk Roscoe and Wilbur by myself, simultaneously (which I consider a huge personal accomplishment, considering I used to get tangled just walking two Chihuahuas! This also proves that Wilbur and Roscoe are extremely well-behaved.) And I took a walk with someone I haven’t walked in quite a while: Keini! I had forgotten how great he is on a leash, and also how cuddly he can be. If you’re looking for an older dog, be sure to consider Keini. 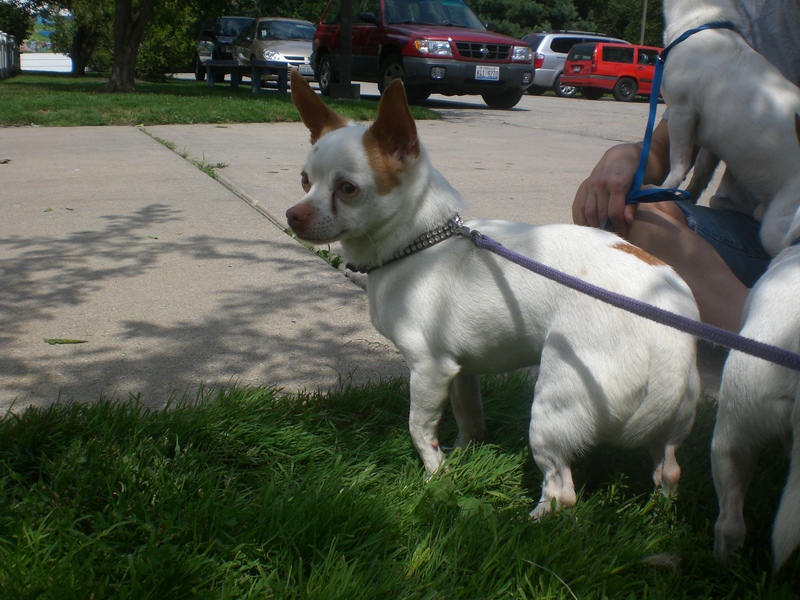 Posted by Meet the Pooches on August 15, 2013 in Dog Profiles and tagged adopt, adoption, animal shelter, animals, Chicago, Chihuahua, dogs, Hound, Labrador Retriever, Orphans of the Storm, pets.